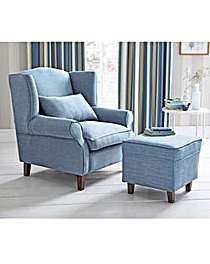 Country Wing Back Chair is rated 4.9 out of 5 by 7. Nothing beats the comfort of a classic wing back armchair and ours is a fine example of the style. Our updated design has a nesting place to rest your head, the support of rolled arms and deeply padded cushions to lull you into relaxation. It's European made on a quality wood frame. The legs have a mahogany finish and the filling is uncompromising luxurious and plump. Choose from Terracotta, Stone, Modern Olive, Mink, Blue, Raspberry or Lavender. Upholstered in slub linen-style fabric. Plump, comfortable foam and fibre filling. 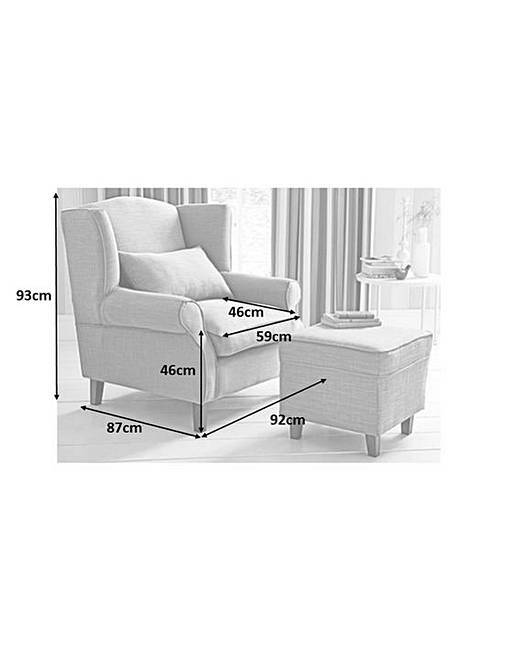 Armchair H.36½ x W.36 x D.34. Seat H.18in. Traditionally crafted on a solid wood frame. 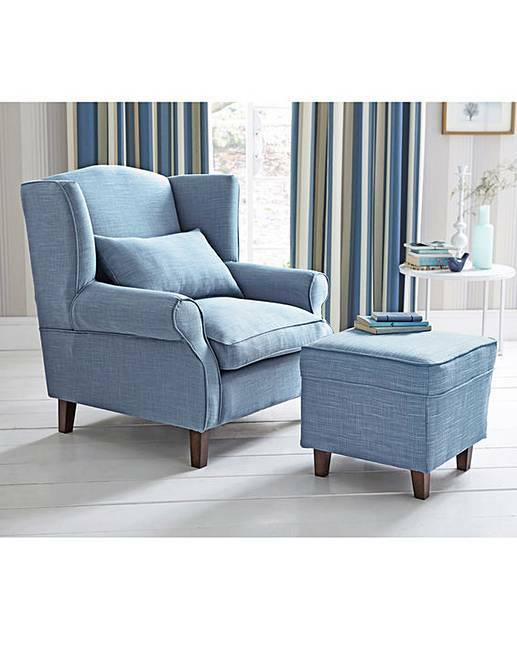 Rated 5 out of 5 by Caerphilly from Great value I had been looking for a wing chair for ages but didn't fancy paying the usual prices. This chair is excellent value. Had £50 off when bought with matching footsool and 20% off that. Amazing. Delivery was good. Chair is lovely colour and very comfy and big enough for me and my toddler to sit on together comfortably for a cuddle. Definitely recommend one if these. Rated 5 out of 5 by Ali from Wing Back Chair (Lavender) Great looking chair, not what I would call lavender in colour to pinky for that but nevertheless it is a lovely piece of furniture. Rated 5 out of 5 by Ety from Very comfortable Brought this online without sitting in it or seeing it properly. Am very pleased with it. It is comfortable, a nice shape and the colour, although not as actually shown on website, is even better, more of a duck egg blue which fits in nicely with my colour scheme. Excellent value for money. Rated 4 out of 5 by Archie from Surising comfort I bought this chair when Dunhelm Mill failed to deliver a similar item - and boy am I glad! Great colour and very comfortable, although the cushion supplied with the chair is a bit big and now lives on the sofa! Rated 5 out of 5 by HappyNLongon from Very nice chair I bought this chair to complete a newly renovated lounge. It is great, very comfortable, with or without the back cushion. It is even better combined with the footstole. It looks nice, has a high back to rest your head on and it feels strong too. Rated 5 out of 5 by Esperance from Excellent After a lot of research looking at chairs with other companies and finding them all not quite the style and height I wanted and far too expensive, I found this chair in a lovely choice of colours and footstool to match. It is beautiful. Just perfect. Comfortable, well made and a gorgeous colour. It was very well double packaged for protection and the delivery service was really excellent. The legs attached easily and I am now thoroughly enjoying putting my feet up in what I think of as my old ladies chair but my daughter sits on in a flash when she visits. I am really glad I bought it at such a reasonable price.